The food game is a vicious business, littered with spectacular failures and well-intentioned enterprises that don’t quite last the distance. Restaurants come and go, sometimes suddenly, sometimes after a period of stagnation, slipping into an unstoppable downward spiral of cut corners, tatty interiors, tired service and crappy food. Harry Ramsden’s at Guiseley typified this type of place, a once proud restaurant suffering from lack of investment, lack of direction and shifting fashions. Where once you had to queue right back into the car park, you could walk straight in and take your pick of tables from the massive restaurant, halved in size with some carefully positioned screens to make it look smaller and fuller. The staff had a resigned air about them…they knew it was rubbish, and they knew what was coming. When it did, when whatever faceless holding company that owned Harry Ramsden’s that particular week decided that enough was enough, there was a predictable uproar from people who never used to go there anyway. If they had, it wouldn’t be closing down, would it? Such is business. Harry Ramsden’s was just another business cutting back in hard times. Yes, they continue to trade in more profitable locations, but the days of international expansion and the ‘biggest fish and chip restaurant in the world’ were long, long gone. The site seemed destined to become luxury apartments or whatever. 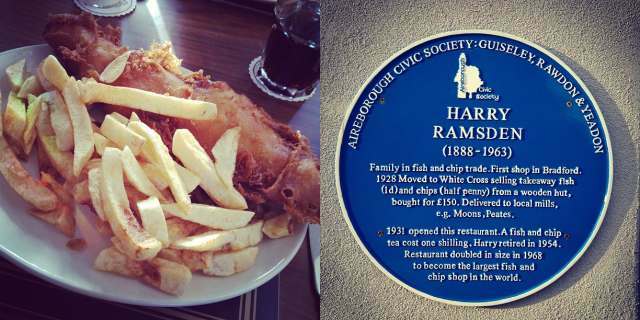 Another Yorkshire-based fish and chip chain bought the building, glimpsing an opportunity to play on Harry’s past reputation. Had people ‘gone off’ fish and chips? Probably not. Had they just got tired of the monotony and dreariness of Harry Ramsden’s, its worn carpets and dismal menu? Yes, definitely. The Wetherby Whaler set to work on a big refurbishment, opening a restaurant nearly identical in every way to how Harry Ramsden’s used to be in its hey day – great food, very slick service, clean and classic interiors, big queues at the door. I remember going to Harry Ramsden’s when I was a child, and it was always packed to the rafters, always alive with the hum of people talking and eating, always an event, and that’s exactly what the new Wetherby Whaler is like. Gone are the dividing screens – there’s no need for illusions anymore – the whole enormous dining room is in use, including the extra space at the back, another room with at least another twenty-five tables in it. It’s a space I haven’t seen anybody venture into for at least a couple of decades, all of it full with more waiting at the door under newly polished chandeliers. The staff were busy, and looked like they were loving it. I recognised a couple of waiters from previous visits, and the difference was astonishing…they looked like they were having fun, proud of what they do again. The food they served was very good indeed – big pieces of fish cooked in crisp batter with excellent chips, everything done properly. There’s always going to be some element of nostalgia for me around Harry Ramsden’s and that building in particular, so inextricably linked it is with my childhood experiences of eating out, but time passes and things change. Seeing Harry Ramsden’s close down was sad, but inevitable. The emergence of something bigger, better and busier in its place comes as a complete, but very welcome, shock. The blue plaque next to the door is a respectful touch, but this is no longer Harry Ramsden’s. It’s a branch of the Wetherby Whaler, and all the better for that. the mister was a fan of Harry’s and was disappointed to see it go. when i mentioned your review he was looking forward to revisiting but wanted to know if the food was fried in beef dripping or not? I imagine it’s vegetable oil, as there are deep dried vegetarian options on the menu. Having memories of queing around the building in the 70’s when going to “Harry’s” was a great treat I was, like others, gutted to see it close. I did still occaisionaly visit the old place, even having a dinner once with Harry Ramsden Jr then a global “Fish and Chip Ambassador”. So it was a crying shame to see it disintegrate so badly over the years. I was happy, therfore to see the Whaler take over but I have to say I was a bit dissapointed, not so much with the fish and chips which were okay (great fish and chips are hard to find) but with the decor which I felt was a bit of a mish mash of styles that didnt really work together. Any way I hope it does well but without that “Harry” magic it’s just a bloody big fish shop!